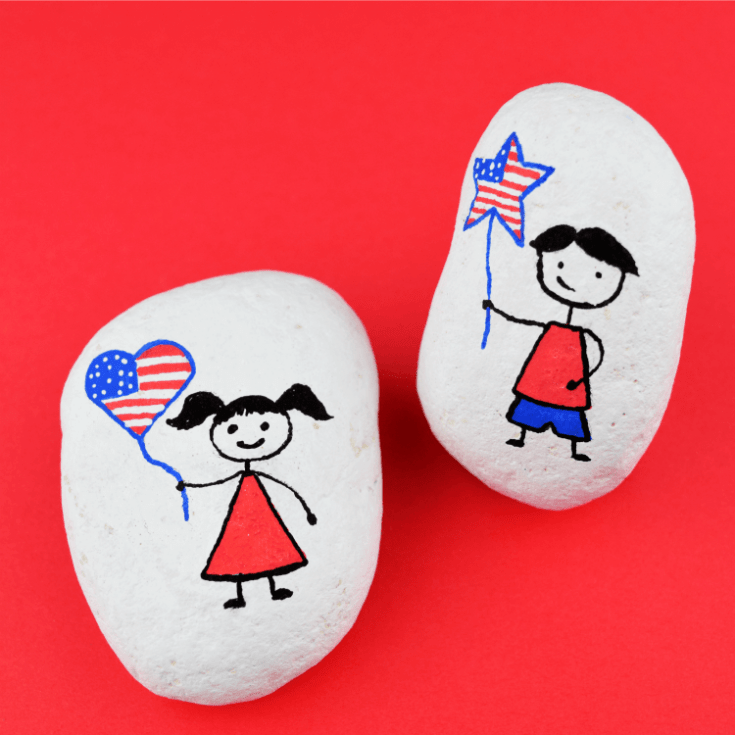 Make one of these patriotic stick figure rock painting ideas for July 4th, Memorial Day, or Veteran’s Day. They make a great rock painting idea for kids, too, because you build a body based on simple shapes. Let’s get started! The little one and I had a few minutes before picking someone up for a playdate and I needed to come up with a quick craft – and a fun rock painting idea was just the thing! These stick figures are easy to make because they’re built on basic shapes. So grab the few supplies you need and let’s get to painting rocks! Video and written instructions are both included so anyone can follow along with this fun craft. Let’s get started making our patriotic stick figure rock! Using simple shapes, this rock painting idea comes together in no time. We painted a little boy and girl in just minutes using rocks we had previously base-coated. Draw a circle for the head, a triangle for a shirt (or dress), and two rectangles for shorts. Add stick legs with little half circles for feet and add stick arms with circles for hands. Make sure one arm goes off to the side. Add a string for a balloon. Trace or draw a balloon shape. Fill in any dark color first because it’s likely they will need a second coat (hair, the flag, etc.) Color in the flag balloon using a small block of blue and red stripes. Outline the balloon in blue or red – the same color as your balloon’s string. Color in the outfit and outline it in black. Once dry, apply a thin coat of ModPodge to protect the paint pen and then seal with polyurethane. Look at them! 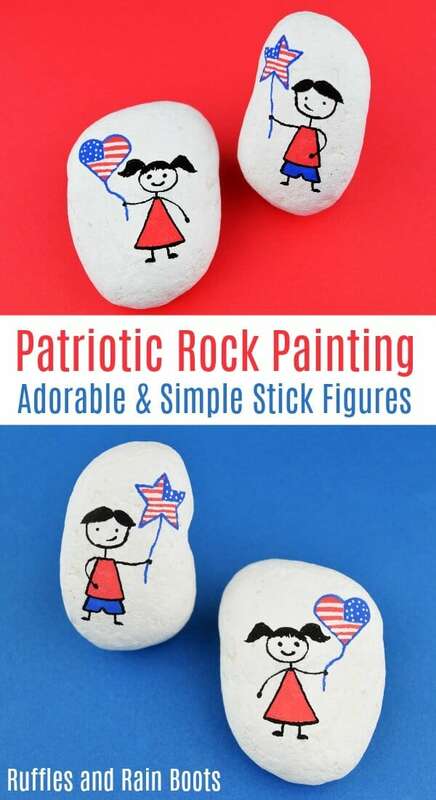 Your adorable little patriotic stick figure rock paintings are ready for gifting, hiding, or displaying. 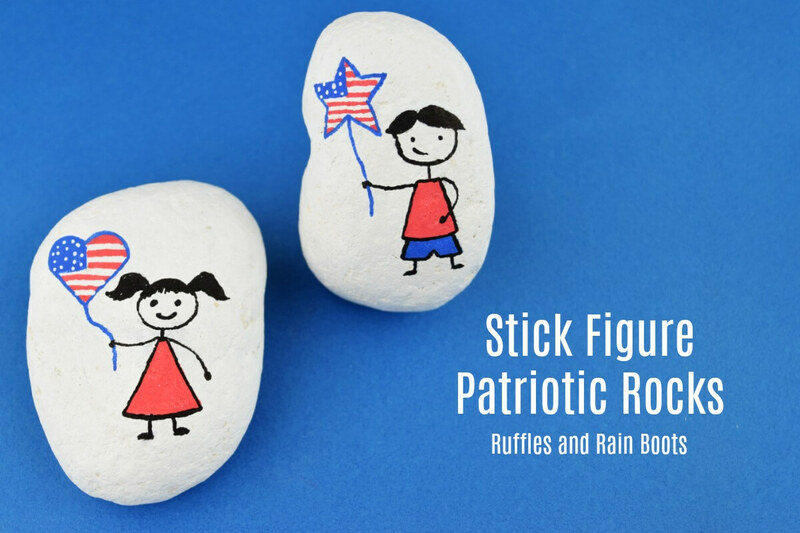 Make one of these patriotic stick figure rock painting ideas for July 4th, Memorial Day, or Veteran's Day. Fill in any dark color first because it's likely they will need a second coat (hair, the flag, etc.) Color in the flag balloon using a small block of blue and red stripes. Outline the balloon in blue or red - the same color as your balloon's string.